Medellín has a storied past but over the last twenty years, the city has done so much to revitalize its neighborhoods, public transportation, and arts culture. We know what typically comes to mind when people hear about Medellín, but there is SO much more to the city of eternal spring. Check out how we'll Live, Work, and Play while we're there. Fun fact, neighborhoods in Medellín are ranked on something called an estrato system. It's based on the socioeconomic demographics of the area. The estrato system begins at 1 and goes to 6, with 6 being the highest on the scale. The area we lived in on our last trip was called El Pablado and is a 5/6 on the estrato scale. It's the area of the city that's most popular with expats and tourists because it has lots of high-rise apartment buildings with incredible views of the city. El Pablado's Golden Mile is a stretch of road from Parque El Pablado to the neighboring town of Envigado. Along the stroll, you'll find malls, shops, and beautiful homes. Parque Lleras in El Pablado is where we'll likely spend most of our free time. It's where most of the bars and restaurants are situated. If you do a google search for Parque Lleras, the first pictures you'll see are nightlife photos. It's clearly the place to kick it. A few other popular areas of the city with high ratings are Envigado and Laureles. 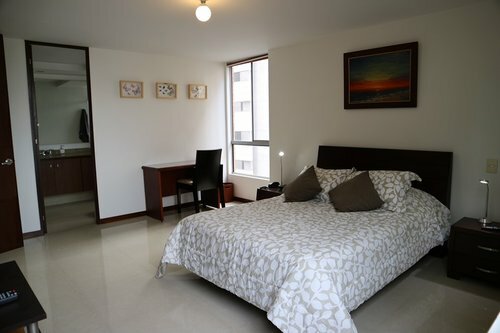 Here are photos of the apartments we lived in during our stay in Medellin. We have a no hostel policy and even if you have housemates, you'll have your own bedroom. Bonus material! Here's a video I filmed for the Wanderists while I was waiting for them to join me in Medellin last year. I did a tour of our neighborhood and coworking space. It won't be easy to get work done when there's so much to be enjoyed here but when we do need to be productive, we'll have some great places to do it. 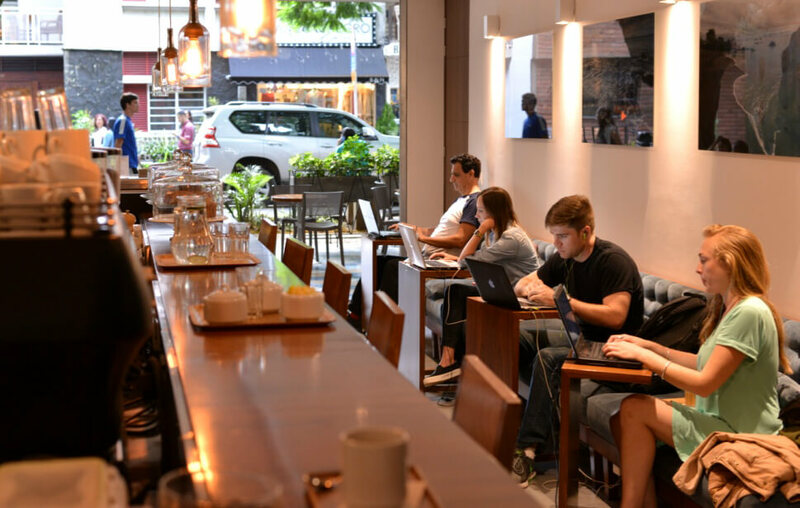 Medellín is a hub for digital nomads. As such, coworking spaces are popping up all over the place. 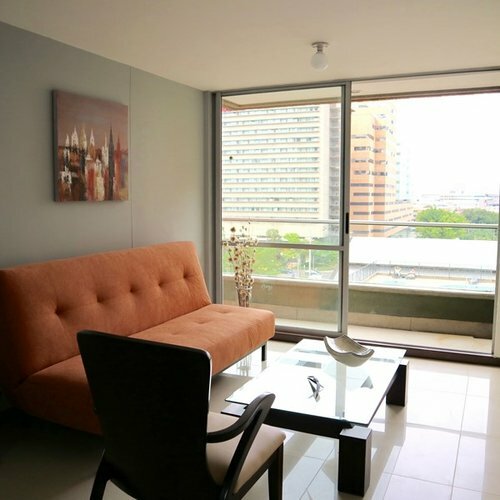 One, in particular, we have partnered with is Global Express, which is located right in the heart of Poblado. Since Colombia does coffee so well, I'm certain we'll be spending some days knocking out our task list next to a cup of good brew. Here are a few of the city's best coffee shops to work from in our very own neighborhood. There's no way we're going to be in Colombia and not catch a futbol match. We attended one last year and it was the most lively sporting event we've ever been to. Colombians LOOOOVE their soccer, the entire city gets excited when the city teams are playing. There are a few other things we absolutely HAVE to do while we're in Colombia - salsa, coffee, and Spanish! We'll link up with our favorite Spanish teacher, Kelly for a group lesson so you can learn some basic phrases that you'll find useful. You'll find that in Medellin, many people do not speak English but are very patient with people who do not speak Spanish so long as they're trying. If there's a place to get some salsa in, this is it! Taking salsa lessons is definitely on the itinerary. A day trip to Guatape is also a must do while in Colombia. It’s about a 2-hour bus ride from Medellín with amazing views. Once we arrive we'll climb El Penol for an even better view. We could literally write pages and pages of things to do and see in the city of Eternal Spring. You'll run out of time before you run out of things to do! Older PostWe’re different. We’re the gap year for grown ups. Real grown ups.